Mike Tracy is the Head Coach of Delaware Academy. 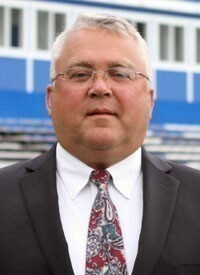 He is the former defensive coordinator at Hartwick College in Oneonta, NY. He previously served as an assistant at Hartwick from 1991-2005 and the DC for the Hawks from 1998-2005. Tracy was the defensive coordinator and inside linebackers coach at Hamilton College for the last six years. He guided several players to All-NESCAC honors and coached the 2006 conference Rookie of the Year and a 2009 D3football.com All-East Region player. Tracy's defenses at Hamilton were consistently ranked among the nation's best. In 2006 the Continentals ranked seventh in Division III football in points allowed per game (10.3 ppg) and eighth in the country in rushing defense (71.4 ypg) in 2008. The team ranked 14th in 2007 in rushing defense and 18th in 2009. Hartwick registered a record of 44-37 during Tracy's previous time as the program's defensive coordinator. His defense ranked 24th nationally in yards per game in 1998 and 25th four years later. Tracy was instrumental in the recruitment of some of the program's most decorated players, including Jason Boltus (CFL player, NCAA record holder, All-American, Melberger Award), Dan Pincelli (Hartwick Hall of Famer, Melberger Award), and Kory Schramm (Hartwick Hall of Fame, All-American). He also coached two of the best defensive players in Hartwick history in Jim Hoysradt (Hartwick Hall of Fame, All-American) and Anthony Tomaino. He also served as head junior varsity coach as well as assistant baseball coach while at 'Wick. Tracy is a 1983 Cortland graduate. He also received his master's degree from Cortland in 2011. He has four children - Tim, Jessica, Mike, and Matt. Three of his children are Hartwick College graduates. He also has five grandchildren, Brielle, Caden, Addelyn, Grayson and Parker.